Power and Play. Magnus Eliasson, Sweden vs. Mikko Kärkkäinen, Finland. It was the battle of the giants in Finnish Open in Espoo, outside Helsinki, last weekend. Home favourite Mikko Kärkkäinen beat swede Magnus Eliasson in the Mens' final and world champion Linda Jansson was victorius against Susanna Lautala-Näykki in the Women's final. By number of participants Finnish Open will not be the biggest tournament this year. By standard, though, this could be the tournament of the year, except of course for the World Open in Holland in december. # The two world champions since the start in 2001: Mikko Kärkkäinen and Magnus Eliasson. 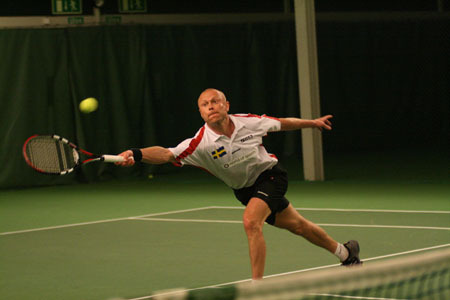 # Recent Swedish champion and World Open-finalist 2004, Roland Helle, Sweden. # Doubles world champion Rickard Persson, Sweden. # World Open-finalist 2001, Toni Kemppinen, Finland. # Old star John O'Donnell, England. # New stars Elmar Schaub, Germany and Pekka Kainulainen, Finland. Already in the first round some strong players had to face each other. Finnish star Toni Kemppinen, not seen very often on the tour, was unlucky to play Magnus Eliasson at that early stage. Despite a victory in badminton Toni lost by 22 points. Another big game was Rickard Persson vs Pekka Kainulainen, who reached the quarter final in World Open last year beating Persson at the group stage. Persson got his revenge and went through by + 17. Eliasson then had to beat Roland Helle in the quarter final. Helle who recently won the Swedish Championships. It's a shame that Mikko Kärkkäinen is seen on the tour only twice a year, in the Finnish Open and in the World Open. He once again showed why he is the best player in the world, in spite of the fact that he hasn't been practising very much recently. 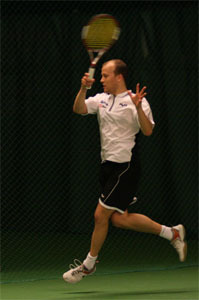 The final against Eliasson was practically won after the badminton, where Mikko achieved a surprisingly big win by 21-14. The table tennis score was 21-11 in Mikko's favour. Mikko got 10 points in the squash, which meant that he needed 16 in tennis. Although Magnus took a 6-2-lead, Mikko was in control after 8 straight points. At 16-10 to Mikko the game was over, + 12 for the finn. A big win for Kärkkäinen who acutally lost to Eliasson in last year's Finnish Open in Lahti. On the road to the final Kärkkäinen showed no mercy to Elmar Schaub in the semis, + 21 before the tennis. Rickard Persson was closer to Mikko in the quarterfinal, losing by 13 points. In the game for 3rd place Elmar Schaub beat John O'Donnell who looks strong after his move to Sweden, where he tries to make a living as a squash coach. The ladies class was small but also hade some strong contenders, such as world number 1 and 2, Susanna Lautala-Näykki and Linda Jansson. After losing out 14-21 in the initial discipline Jansson did not, however, think that it was her day. Perhaps that made her play more relaxed, she said to Racketlon.com, and a surprising victory in badminton 21-17 as well as a sensational start 11-1 in squash turned the numbers in her favour. At that stage she was leading the match by +7, a difference she maintained until the end of the squash (21-11). A Jansson lead before tennis is normally very bad news for the competition and this time was no exception although Lautala-Näykki must have fought well to get 11 points before the match ended at 15-11 to Jansson, who is now aiming for the World Championhip title at the end of this year. "Look out for Mikaela Björnström" Jansson said after playing her in the semifinal. Björnström (Finland) is a tennis specialist on national elite level, who upset the seedings by beating Germany's established Jutta Schaub +6 (14-21, 7-21, 21-10, 21-5). "She is at least as good as I am in tennis" Jansson said and continued to predict that she might cause a lot of trouble in the future. Björnström was not far off at winning the bronzematch, where she needed to keep Rusila at 6 for a Gummiarm tiebreak. Their match ended at 17-7. Hanna Rusila had a tight win in the quarterfinal by 3 points over Natalie Lawrence, England, but then lost to Susanna in the semis. England got a victory in the Men's O45 class by Richard Whitehouse. In the U21 "the next Mikko" - finnish player Antti Tyyskä - was in a class of his own. The tournament started with the men's doubles on Friday. The new pair Rickard Persson/Roland Helle defended their top seeding by beating O´Donnell/Jon Foulds in the final, + 15. After four Finnish Open in Lahti, Espo was the new venue of this tournament. Probably the biggest racket center seen on the world tour so far, this could well be a future host for a World Open. Espo racket center may be lacking a bit of charm, but there seems to be a court everywhere - We can bring 1000 players here, said tournament organizer Martti Vottonen.